You must have noticed that those people who do regular aerobic exercises are lean, smart and less muscular as compared to those who do resistant heavy weight lifting workouts. Yes this is true. Aerobics are very refreshing, and healthy exercises which promote healthy body functioning and weight loss. Aerobic exercises are those exercises which can be continued for longer period of time as compared to anaerobic exercises. Because aerobic exercises are less intense. Cycling, Swimming, Walking, Jogging and dancing are all aerobic exercises. These exercises can be carried out for longer duration. During aerobic exercises oxygen is being used in process of energy production and this oxygen promotes oxidation of fats and utilize them to produce energy required for aerobics. How to do Aerobic Exercises? How to do aerobic exercise? In aerobic exercises what mater the most is the duration of exercise. So the speed of exercise should be maintained at such pace that you can do exercise for longer period of time. For example if you have chosen jogging as your aerobic exercise then you shouldn’t run very fast, you will tire early but on the other hand you shouldn’t walk too slowly. Actually During aerobic exercises your heart rate must increase to around 130-140 beats per minute. Allen devised a formula to know maximum heart rate for athletes. 180 - (your age) = Maximum aerobic heart rate. For example if you age is 25 the maximum effective aerobic heart rate will be (180 – 25 ) 155 bpm. This formula tells us about the maximum heart rate. What is the minimum effective heart rate in aerobics? Keep in mind that your heart rate during aerobic exercises should be at least 30 % faster than resting heart rate. for example if your resting heart rate is 80 bpm (beats per minutes) than your heart rate during aerobic exercise must be at least 104 bmp ( 30 % of 80 = 24 , 80 + 24 = 104 ). So the optimal aerobic heart rate range in 25 year old man will be 104 – 155 bpm. So maintain the jogging speed to an extent that your heart heart rate increases and you can maintain that increased heart rate for at least 20 minutes. Then you will notice miraculous difference in your strength and stamina after few weeks. After few weeks you will be able to increase your duration, as you will have built enough stamina. Aerobic exercises are very beneficial. Let us explain their benefits one by one. During aerobic exercise oxygen and energy demand increases. To meet these demands Heart rate and blood output increase. If a person regularly does aerobics, Then his heart muscles strengthen. His heart will be able to pump more blood more efficiently. His heart will become healthier. A study suggested that aerobics exercises slow down the process of aging. 2. Aerobic exercises build your stamina. If you do aerobic exercises regularly, after sometimes you will be able to increase your duration of exercise. For example, in the beginning you were hardly doing aerobics for 20 minutes after few weeks you will notice that now you can do aerobics for longer duration. Our body has this great ability of adapting itself to a specific situation. When a person do more activity, his glycogen stores increase and during aerobics this glycogen is broken down to provide energy. When these glycogen stores deplete or the supply of oxygen decreases person will start feeling fatigue and tiredness. 3. Aerobic exercises burns your fats. During aerobic exercises both carbohydrates and fats are burnt. while in weight lifting and strenuous exercises only carbohydrates are burnt. This way aerobics are classified as best weight loss exercises. 4.Aerobic exercises Decrease LDL and Increase HDL. Aerobics increase HDL which is good cholesterol and is good for heart and vessels. On the other hand it decreases the level of LDL, which is bad cholesterol and is involved in cardiovascular diseases. 5. Aerobic Exercises maintain blood pressure. During aerobic exercises, blood vessels dilate and can accommodate more blood. As a result blood pressure decreases. It also decreases bad cholesterol which decreases the elasticity of walls of vessels and makes them hard. The hardened vessels can’t dilate which result in increased blood pressure. So Aerobics help to decrease blood pressure by vasodilatation and decreasing bad cholesterol. One of the huge benefits of aerobics is that they accelerate metabolism and maintain it for several hours after the exercise. A study suggested that cycling for 45 minutes accelerates metabolism for next 8 – 12 hours. Aerobics keeps a person active throughout the day. He feels better and healthy. Aerobics stimulate growth throughout the body. More calcium is deposited in bones and they become stronger. 9. Aerobics Decrease the risk of diabetes. Those people who are obese or have family history of diabetes should do aerobics. As it delays the onset of diabetes in high risk individuals. Because the high glucose in blood is being used and less insulin per day is required. How many days a week should You do Aerobics? One should not do aerobics every day. Body needs rest and the depleted nutrient stores need time to restore. One should do aerobics at least 3 days a week but not more than 5 days. Is there any harmful effect of aerobics? 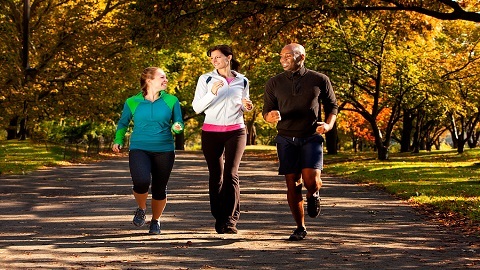 Mild to moderate aerobic exercise are not harmful at all. They are good for health. But excess of aerobics is bad like any thing else. Doing aerobics every day, without taking healthy diet will accelerate the process of aging. One should give the body proper rest that it deserves.